Take charge of yard with Toros PowerPlex 40V Max* T90 Lithium Ion battery. The T90 battery has 40-volt max, 2.5 Amp-Hour, and 90 Watt-Hours. It charges in approximately 60 minutes in the quick charger. The T90 battery is interchangeable with the Toro PowerPlex tools. Take charge of the yard with Toro PowerPlex tools. 40-volt max, 2.5 Amp-Hour, 90 Watt-Hour battery. Charges in approximately 60 minutes in the quick charger. Comes with on-board power meter. The BLACK+DECKER LBXR20 20-volt MAX lithium-ion battery is always ready to go thanks to its ability to hold charges up to 500 days. The BLACK+DECKER 20-volt MAX lithium-ion battery offers a longer lifespan and retains its charge 5x longer than similar 18-volt NiCad batteries. It's compatible with the full line of BLACK+DECKER's 20-volt MAX line of power and gardening tools, and you won't be limited by an extension cord. The ECHO 58V 4 Ah Lithium-Ion Accessory Battery Pack is the most advanced, professional grade high voltage cordless Battery in the industry. Featuring triple protection electronics, this battery is equipped to prevent overcharging, overheating and overloading. With a 1 hour recharge time, users can complete big jobs without worrying about running out of power. The ECHO 4 Ah Lithium-Ion Accessory Battery is backed by an industry-leading 90-day money-back guarantee, a 5-year consumer warranty and a 2-year commercial warranty. PowerPlex 40V Max T90 Li-Ion Battery Take charge of yard with Toros PowerPlex 40V Max* T90 Lithium Ion battery. 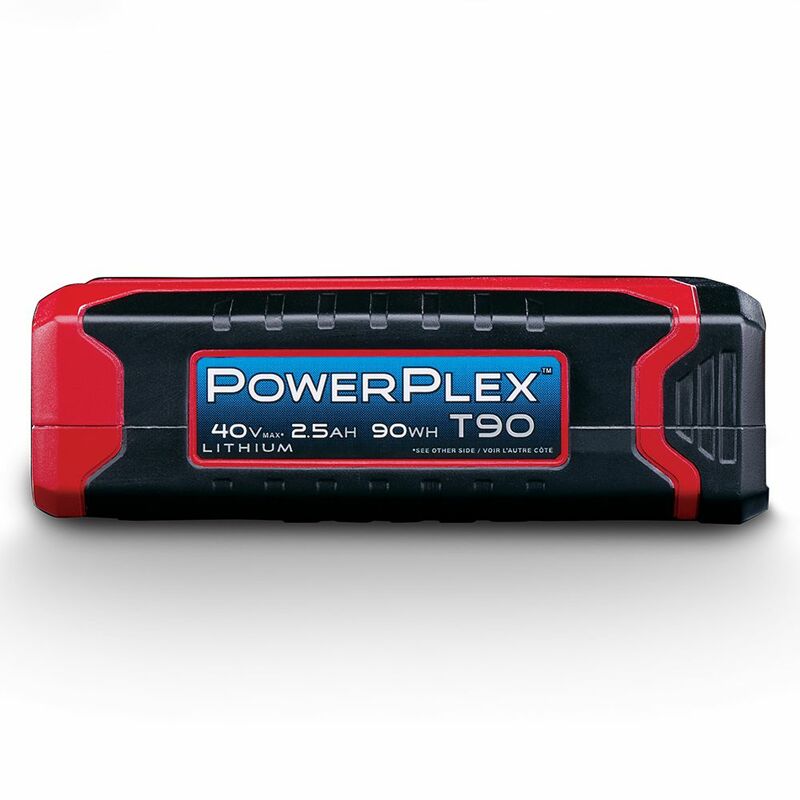 The T90 battery has 40-volt max, 2.5 Amp-Hour, and 90 Watt-Hours. It charges in approximately 60 minutes in the quick charger. The T90 battery is interchangeable with the Toro PowerPlex tools. Take charge of the yard with Toro PowerPlex tools. PowerPlex 40V Max T90 Li-Ion Battery is rated 2.9 out of 5 by 9. Rated 1 out of 5 by Duke from Power only lasts for 13 minutes on a leaf blower.... Power only lasts for 13 minutes on a leaf blower. Rated 3 out of 5 by EagleOne4 from Weight and Time Duration are Problems The charger and battery are massive as is the Toro blower Model 51690 making it heavy to maneuver in use, but the biggest problem is the time it will run on a full charge. I get between 10 and 15 minutes which does not even get 1/4 of my yard blowing leaves and by the time it takes to recharge either I can rake the leaves which I have had to do or I would have to start over as more leaves have covered what was done. I am not satisfied to recommend this blower due to the short time it will run on a full charge. Using the charger and removing and inserting the battery is very easy both in the charger and the blower. Mine came with no instructions but I easily figured out its use and recharging. Rated 3 out of 5 by Brad from The two batteries I have now are working great. I... The two batteries I have now are working great. I had to return one battery as it completely failed after two weeks. If these two do not fail I will be satisfied. Rated 4 out of 5 by Mike from The trimmer/edger has plenty of power but the 2 amp... The trimmer/edger has plenty of power but the 2 amp hour battery doesn’t last long. Better buy a spare battery or get the larger 5 amp hour battery. Rated 4 out of 5 by HomeDepotCustomer from Disappointed in battery life. Bought a second battery so one is charging while using the trimmer.... Disappointed in battery life. Bought a second battery so one is charging while using the trimmer. Batteries are very expensive! Rated 1 out of 5 by busseja from After 5 uses won't charge only get two lights but more importantly, doesn't power the blower at ... After 5 uses won't charge only get two lights but more importantly, doesn't power the blower at all for any time. Measures 37.5V so the problem is more than likely weakly designed electronics. After opening it up I noticed the unit is not sealed. It is open to the elements. That means water can enter. The circuit card does not appear to be dipped in anything so all the component leads are open. Many of mine were corroded. Cleaning did not help something shorted and was destroyed is my guess. I don't think I can recommend this. No one should expect to keep lawn equipment dry all the time.